The adrenal glands produce hormones that underlie the body’s mechanisms for coping with physical and mental stress. Overtraining in athletics, chronic anxiety, worry, nervous tension and other factors associated with excessive cortisol release are linked to adrenal exhaustion and fatigue. Over-reliance on caffeine and other stimulants also taxes the adrenals. Vitamin C, DMAE and pantothenic acid participate in the synthesis and release of adrenal hormones. Traditional healing systems, both Eastern and Western, advise the use of adaptogenic herbs that help the body to relax and rebuild. 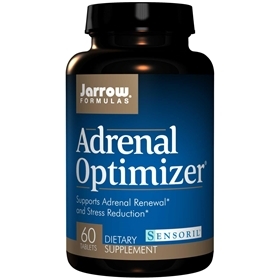 Adrenal Optimizer works best when taken over an extended period of time and combined with adequate rest and sound nutrition. Take 1 tablet 1 to 2 times per day or as directed by your qualified health care consultant. Cellulose, dicalcium phosphate, stearic acid (vegetable source), magnesium stearate (vegetable source) and silicon dioxide. Coating consists of sodium carboxymethylcellulose, dextrin, dextrose monohydrate, lecithin and sodium citrate.